Lisa is Bossy: La la la la Ladurée!! La la la la Ladurée!! I almost skipped home from work last Tuesday singing a little "la la la la" tune and day-dreaming about perhaps the very best French macarons in le monde!... LADURÉE. Oh Ladurée... I was stupidly unaware of the French macaron the past times I've been in Paris. Perhaps because most of mainstream America was not yet all that familiar with the French macaron. It's been almost 4 years since I was last in Paris and I am now DYING to go back to just eat my way across all of France. I was in the office last Tuesday busily minding my own functional specifications documents, when I got a text and an IM and perhaps an email all at the same time: from my old vice prez's executive admin. "I have some cookies for you from Paris and you have to come get them right away." Yup. Just "some cookies from Paris." 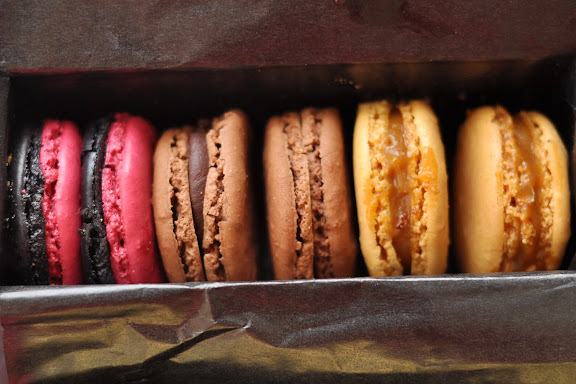 Madame Admin - cookies from Paris are most likely macarons and they deserve to be addressed with all sorts of respect. Even the BOX is flawless and well made! A few emails back and forth later, I got the full story. My old VP was vacationing in France, she returned the night before and was still on PTO, but called her admin to meet her in the parking lot and then deliver 3 very special boxes of Ladurée French macarons to 3 very special people in our office. It didn't even matter to me who the other 2 were, all I cared was that I was ONE! And people, this was a HUGE deal. She is a VEE-PEE. She is a BUSY WOMAN! I was touched beyond belief. Are those angels I hear singing? It's worth mentioning that I have made macs and brought them into the office in the past. When Ms. VP got ahold of one, I was worried she might dance a little jig right there in front of me. She told me how much she loves macarons and that mine tasted like the ones from Ladurée...and while I've heard the same thing from my parents - I still don't believe any of these people. I think they're just trying to get me to feed them more! Needless to say, I hustled my derrière over to the appropriate building and picked up my little box of *sigh* Ladurée macarons. This wonderful woman. The folks at Ladurée informed her she MUST deliver the cookies the NEXT DAY and she MUST carry them with her on the plane and she MUST put them in the overhead bins where it is cooler. And she did all of this just to get us our little bits of cookie gold. I shared with NO ONE! I creeped around the office the rest of the afternoon, protecting my little box and calling it "My Precious". I finally snuck home early to revel in the excitement of this little gift that traveled 5500 miles to get into my hot little hands! The verdict? DELISH. The flavors were wonderful. The texture was perfect. I could tell they weren't QUITE as fresh as would be ideal, and even with all that care they were a bit cracked. But it was SUCH a fun day. And....err... dare I say... my macarons don't taste THAT far off. If anything - this exciting little package told me that I'm really not too far off the path. All the batches of macs I've made since last March, and I'd never even eaten a really good one. Well. Until now. 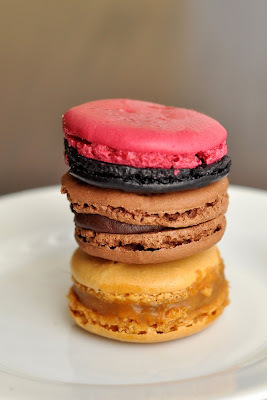 It would seem unfair to complete this post without telling others (my local friends only, I'm sorry I can't help non-Bay Area folks) where they can go buy quality macarons themselves. 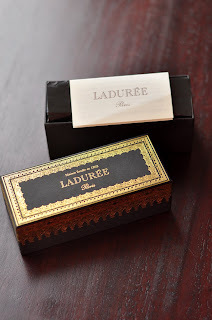 We of course do not have Ladurée or Pierre Hermé here in San Francisco [yet?] but we do have some other bakeries putting out a VERY good product. Anita and I scampered around the city a couple weeks ago gathering macarons for Jen. We wanted to do a Macaron Taste Test and boy did we. Here's what the general consensus was... Helen even threw in her 2 cents and being a Frenchie AND a professional pastry-chef, I value her opinion immensely. 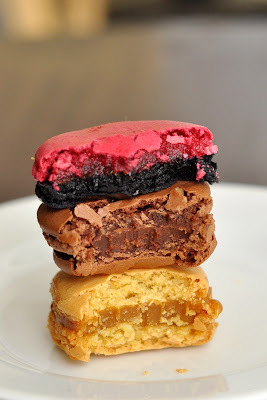 Paulette Macarons (SF): Flavors are perfect here and the cookie is almost perfect. Recommend the cassis. (Helen's fave) I prefer a bit more "chew" to my macaron than Paulette's turns out. But then again, their cookies are shipped up from their Beverly Hills location each morning. Miette (3 locations in SF): They're the original in SF for making French macarons; have been doing so for at least 4 years as far as I remember. Their macs are not fancy or sophisticated and tend to be a more "rustic" cookie. No food colorings and a less fine almond powder in the cookie. I probably prefer these the best in texture, but not in appearance or even flavor. And for crying out loud - whatever you do, AVOID Cocola for macarons. I threw mine away after taking one bite. It was horrendous! 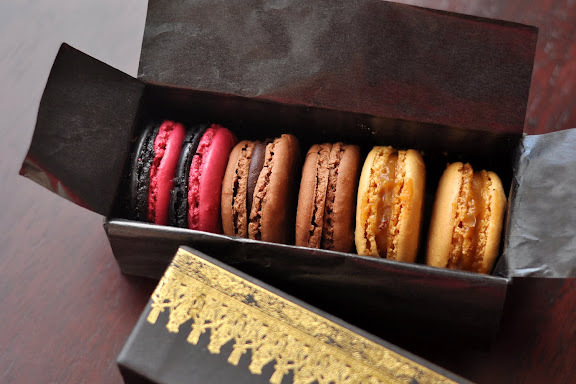 Other people might disagree with me, but I have been CONTINUALLY disappointed with macarons from Bouchon - both the Yountville location and the NYC location. Very dry. Flavors were okay. La Boulange de Hayes are not so great either. The ones I tried were very soft and almost mushy. La Duree macarons are the best! Lucky you to receive such a treasured gift. Yes, you are so right, never share Laduree macaroons. My favorites are the pistachio and coconut. Just came back from paris and had breakfast there (my most recent blog post). beautiful pictures! I love the colours, they remind me of the colours of autumn. You are so lucky, and that is one very nice VP to bring them to you right away from Paris. 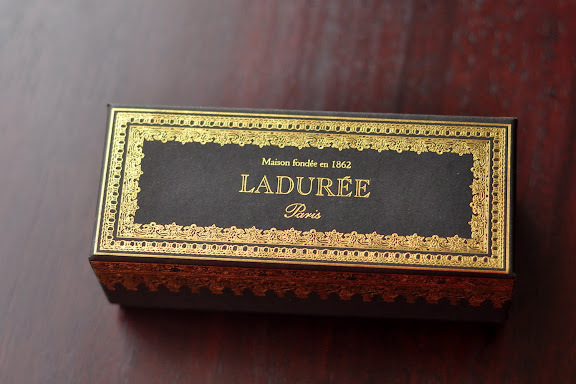 I was in Paris two years ago, and my niece had mentioned Laduree. I didn't know about French macarons then, and I thought she meant macaroons (the coconut kind). Our hotel gave us some cookies from Laduree. It was after we left Paris that I realized the cookies were macarons from the same place my niece mentioned and that our hotel was near Laudree! Sigh. haha I hear ya about Cocola! Although I had a couple of macs from the farmer's market in downtown Palo Alto once, and also at Embarcadero, and both were pretty good :) Forget which bakeries they were from tho! Thanks once again for the lemon and passion fruit macarons. 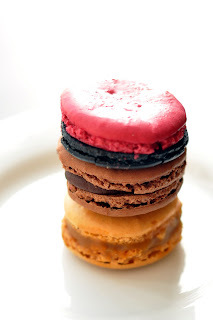 And of course, I had not read this blog until after I started my local search for french macarons. Since I work in SJ, Cocola was the most convenient. I was completely disappointed. And only now I read your post... since I live in RWC I will visit Pamplemousse very soon.. Thank you again Lisa!